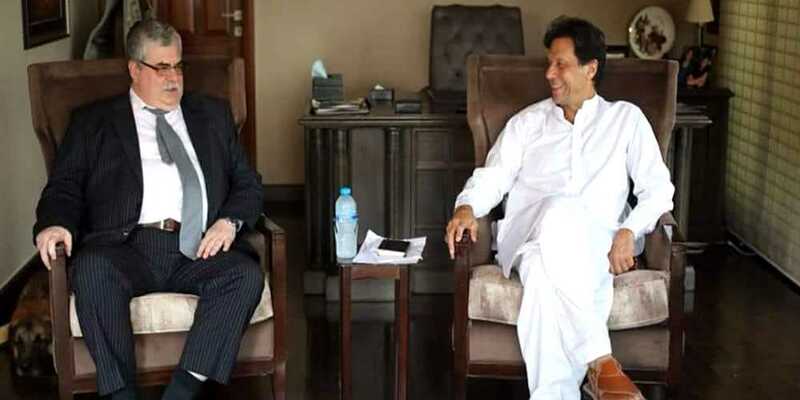 Russian ambassador to Pakistan Alexey Dedov on Thursday called on prime minister-in-waiting Imran Khan at his Bani Gala residence where he stressed the need for improved ties between the two countries. Dedov said that the military exercises between the two countries had been successfully conducted in 2017 and 2016. The envoy was also grateful to the Pakistani pilots who saved a Russian climber’s life trapped on the Karakoram range’s peak recently. The Russian ambassador conveyed that Moscow wishes to improve relations with Pakistan. He said that Russia wants to foster economic cooperation and people-to-people contact as well. Moscow stands by Islamabad in the fight against terrorism and its efforts to maintain peace in Afghanistan, he added. While Pakistan Tehreek-e-Insaf (PTI) supremo Imran Khan said that the Pakistan also wants to improve bilateral ties with Russia. He invited Russian drilling companies to start their operations in the country.